Have you played along with the TCPTUES328 challenge? It's about getting into shape; using two or more geometric shapes on your project. So many choices and options. There is still time to link up your project to the TCP Blog and have a chance at winning a TCP gift certificate. For my card, I am using the set of Just Let It Happen. I love this set! Cheeky and loving at the same time. Using some pattern papers from EP, I created the background with two different sheets and cut out the Square Stamp die with a third. The image was stamped and colored in with Copics before popping it up over the stamp die. The look was completed using a heart cutout from the Small Envie die set to be placed on the bottom of the stamp die and the sentiments stamped directly onto the patterned paper. Some mini rhinestones were added for some bling. Thanks so much for stopping in and be sure to check out what the rest of the Kitty Cat Pack have done! Have a great week! I hope you all are having a great weekend. It's that time! Feature Day with the YNS DT. The theme is using hearts on your project. Perfect for this time of year and not too hard to do. For my card, I created yet another CAS using both the Scripty Love Die and the Cool Tag Patterns die set. I really can't stop using this die! I love the simplicity of it and of course the multiple uses you can get out of it. Using a light grey cardstock, (one I found in my stash, but not sure who makes it) I stamped the flourish design from TCP as the background with the YNS Stone Grey ink color. I cut out the center tag using some b/w MME patterned paper and popped that over the top of the flourishes. The love script is cut out using some red flocked paper along with the coordinating hearts in this set. I glued the love over the banner and popped up the hearts around. The card was completed using some Liquid Pearls for an added design. Be sure to stop by the YNS Blog to check out the rest of the fabulous creations and don't forget to leave a little love while you are there. You can have a chance to win a stamp set of your choice!! Thanks for stopping by and hope you have a great Sunday! I hope you all had a great holiday weekend and were able to get a little crafty. Have you seen the latest TCPTUES? It's all about 'Thank You's' and hope you are able to play along with us. 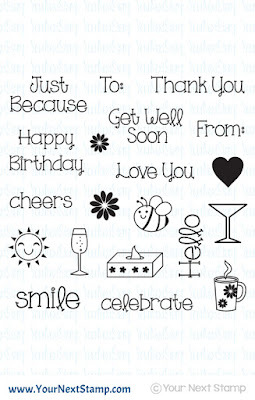 For my card, I am using a few different elements to create this CAS thank you. Using the stars stamp from the Winter Style set, I stamped and heat embossed the stars with both a silver embossing powder and a translucent silver glitter embossing powder for added sparkle. I enhanced the stars by adding some glitter gel pen around some of the stars and stamped in Memento Grey Flannel, the sentiment in the center of the card from the Simply Said set. For the bottom, I dry embossed just a portion of the bottom panel and added a thin strip of silver card stock above the embossed portion. The card was then completed by adding some rhinestones throughout. Don't forget to add your creation to the linky on the TCP Blog for your chance to win a gift certificate to the TCP Store! Thanks so much for popping in and taking a peek! It's time for another DT Dare with Your Next Stamp! This month's dare is to feature 3 colors. I could not resist using the newly released Hug and Kisses paper collection and the Love and Latte set to create this CAS card of three colors. Three colors I love together too! Using the new Heart panel die, I cut out the white card stock and layered it over the patterned paper for a fun dotted heart look. The image was stamped and colored in with Copics, while the sleeve was paper pieced using an embossed scrap paper I had from Bazzil. That image was then popped up over the panel and the sentiment was stamped directly onto the center of the panel. Easy peasy and CAS! 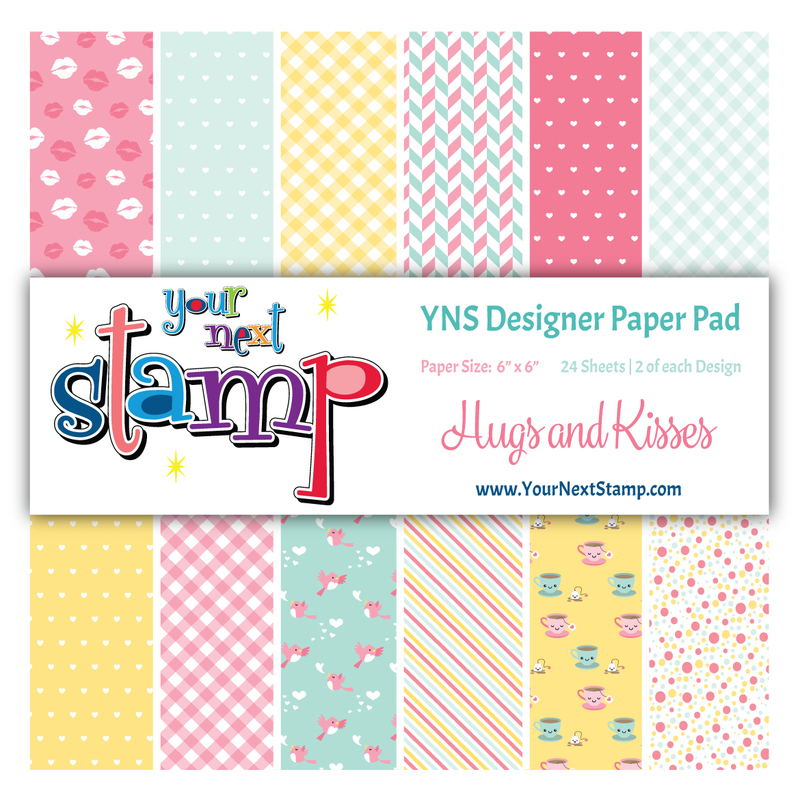 Don't forget to leave a little love on the YNS blog for your chance to win a stamp set of your choice. Thanks for stopping in and taking a peek! Have a great Wednesday! Time to get that list out and shop for all those favorite sets you want from Your Next Stamp! That's right! It is release time and blog hop. For my first card, I am using the new set of Love and Coffee. I just adore this set and see myself using it quite often. Using the new Hugs and Kisses paper, the sky was made and the Puffy Cloud border used for the clouds. I paper pieced the mug and popped it up as if it were flying through the clouds. The sentiment was stamped directly onto the panel. For my second card, I used the new Cool Tag Patterns set to create this CAS love card. Using some embossing powder, the image and borders were created. The love was cut out using the new Love die and the paper used is flocked. I love how this turned out. As always, Karen has a great deal for you to enjoy for your shopping enjoyment of this release. She is offering 20% off your order! 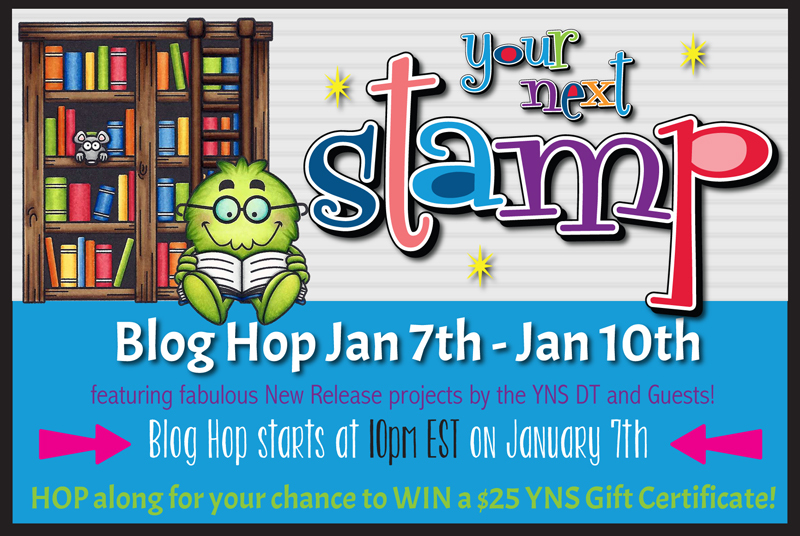 Don't forget to leave a little love as you hop for your chance to win $25 to the YNS Store! Thanks for hopping by and happy shopping! It's that time! 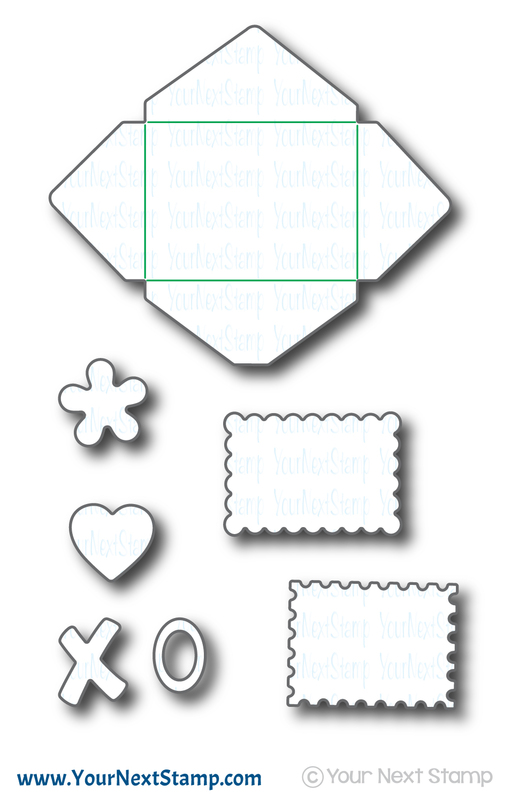 Sneak peeks for the January release of Your Next Stamp! You will feel the love with this release and your creative mojo in sharing that love will be ready to go. As usual, the DT have some awesome sneeks to share with you all and you don't want to miss out on the hop tonight. Is your pad of paper and pen ready to joy down your favorites? Let's get started with this set called Sweet Little Greetings. This is such a perfect set for cute notes and tags. Which is why I made my card a 4 Bar size. Perfect! In addition to using this set, I paired it with the new Mini Envelope die and the super cute new release paper pack of Hugs and Kisses, This is a CAS card that I felt worked well in making it sweet and petite. I stamped the sentiment on the enclosure, adhered it slightly at the top and finished it with a heart cut out included with the envelope die. While the card panel looks as though it is set on top of the patterned paper, I actually cut out thin strips to glue along the edges. I love the look the design of the patterned paper gave the card. 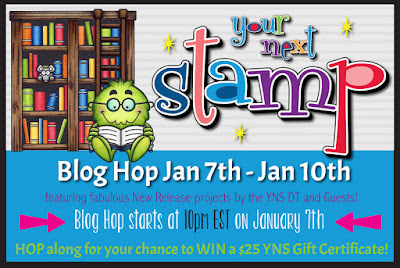 Don't forget to peek at all the fun creations on the YNS Blog and come back tonight for the hop for your chance to win $25 to the YNS Store just for leaving a little love! Thanks for stopping here for a quick looksie. Have a great Friday and we will see you at the hop! Happy Friday crafty friends! I hope you all had a great holiday and now ready to tackle the New Year. It was nice to have most of the month off from crafting, allowing me to get ready for Christmas and spend some time with family. I am back to share with you the first Friday Challenge for me this year with Your Next Stamp. I chose to use the color combo with the fun set of Critter Crew two. The bird is colored in with Copics, fussy cut out, and popped up on the Cool Tags Two cut out. The sentiment was stamped over the paint swoosh from the Paint Swooshes and Splatters set with YNS Stone Gray ink. 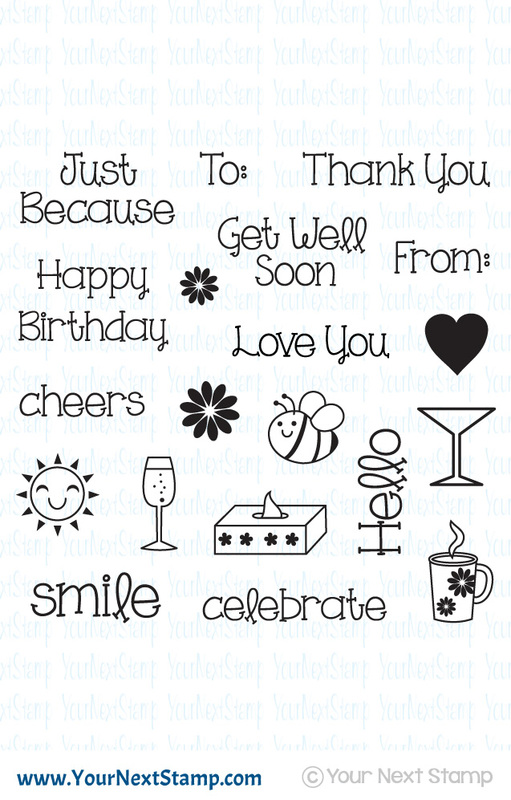 The card was completed with a thin strip of patterned paper from Graphic 45 and some ribbon for the bow. We hope you are able to play along with us on this challenge for your chance to win when you upload your project to the YNS challenge page. Thanks so much for stopping by and taking a peek!